Hove Park is popular with local residents, dog walkers and runners. The park features a mix of large areas of open grass, mature trees, flower beds and recreational facilities. At the eastern edge of the Park is the ‘Fingermaze’, a piece of public sculpture carved into the park and lined with stone and lime mortar. The Fingermaze is a giant fingerprint which incorporates a Cretan labyrinth within its whirling design. Interested in volunteering and getting more involved at Hove Park? For more information on Hove Park, and ways to get involved in the park's community future, visit the Friends of Hove Park website. Toilets. Find out more about public toilets in the city. Hove Park is an accessible park. Find out more about disabled access parks in the city. Click the map to find the park's location. Alternatively you can download a guide to Hove Park (PDF 2.3MB) to print off and bring with you. The 5B, 14, 14C, 55 and 56 buses serve the park throughout the day. Further information and timetables available from the Brighton & Hove Bus company. There are cycle lanes leading to the park from the city centre and various places to secure your bicycle to around the park. For more information on cycling around the city check the Journey On site. 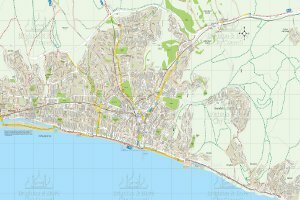 Download a city cycle map here. You can hire a bike from BTN BikeShare at the Old Shoreham Road (southern) entrance. There is free parking available along Goldstone Crescent which surrounds most of the park. Hove Park's great claim to fame, the Goldstone, lies in its southwest corner. 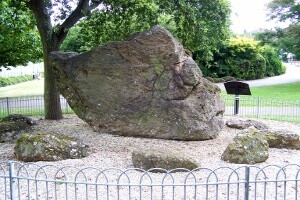 This huge rock, weighing about 20 tons, is commonly believed to have been used by the Druids for worship. The shape of a human face is clearly visible in the stone - have a good look and you'll spot it. Hove Park is one of seven parks in the city that is recognised by the Green Flag award scheme. You can also Dedicate a Bench or Donate a Tree at this park. Park Rangers - What are they doing in your area?